This one was composed at a cruising altitude of 35,000 feet initially above the Atlantic Ocean and latterly over the north-east corner of Canada as the plane headed ever closer to the city of Toronto. The headphones were plugged into the i-phone and as I went through the songs I typed the words into its ‘Notes’ function from which I later did a cut’n’paste and edit. 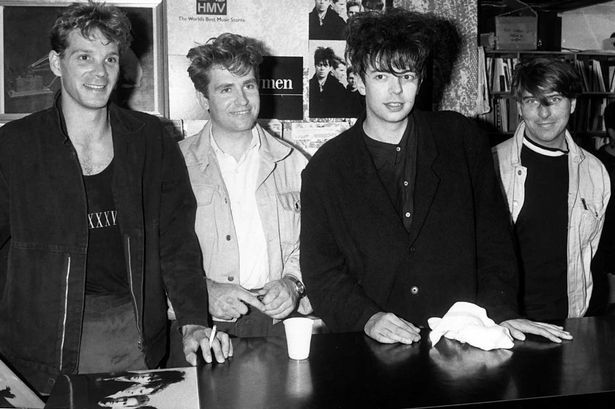 Echo and the Bunnymen are still going strong these days, thirty-seven years on from their original formation. Well half of them are at least…..
They’ve made a lot of great music in that time but they’ve also released a fair bit of stuff that hasn’t quite hit the mark which, to be fair, is a sentiment that can be applied to almost any act which has been going for that amount of time. I don’t think it will come as too much of a surprise to find that what I consider to be the perfect compilation focuses entirely on the early 80s when they were at the peak of their powers and could do no wrong. Dark, brooding, intense yet ridiculously danceable….especially if you’re wearing your raincoat and the main shapes you’re throwing involving the shaking of shoulders. The opening track to what I consider their best album was always going to be the first song on this compilation. You’re on the dance floor and you’ve got those shoulders nice ‘n’ loose by now. Well let’s see those hips sway and while you’re at it get the arms swinging above your head. The band put the word Discotheque in brackets after this one. Years later Bono and his boys pinched both the title and the tune in an effort to prove they were a meaningful and relevant musical act. The sound of three musicians and a vocalist at the very top of their game with a song that in 50 or 100 years time will still have the ability to make those hearing it for the first time stop in their tracks and go ‘wow’. It’s little wonder that Mac the Mouth came out of the studio on the back of this and declared that Ocean Rain was the greatest album of all time. It isn’t….and indeed as I’ve already indicated it’s not even the greatest Bunnymen album but I think it’s fair to say that this is the greatest Bunnymen song. But how do you follow it???? Released originally as All My Colours but re-named with the one-word chorus when this stunning live version was put on the b-side of the 12″ of The Cutter. The recording is taken from was a show at one of the earliest WOMAD Festivals back in 1982 which explains why the Royal Drummers of Burundi happened to be in Bath at the same time. It’s an incredible arrangement for a one-off collaboration and is the perfect demonstration of the fantastic arranging and drumming talents of the late and great Pete de Freitas. The fade in and slow build-up lulls you into a false sense of security that this is going to be a bit of a non-event. But then comes the catchiness of the simple chorus before Will’s attack on your aural senses and you realise that you’re listening to gothic atmospheric rock at its very finest. And now you’re listening to indie guitar pop at its very finest, all the while jumping back on that dance floor for a bop…..or two…. ……for with this piece of glory blaring out over the speakers nobody will want to vacate their spot under the glitter ball. In 1983 I was convinced the band really were going to conquer the world for the simple fact that they not only made great records but they delivered what were blisteringly hot live shows….literally when the majority of the audience refused to remove their overcoats. The sweat pours out of you when you wear an overcoat to a gig. It’s the contribution of the Indian musician Shankar that really sets this single apart as can be evidenced if you listen to the original version which was rejected by the record label as being too uncommercial. When this track first aired as part of a John Peel session in late 1983, it was a medium-paced but hugely enjoyable bit of indie-pop. Somewhere over the ensuing months the band came to the conclusion that it would make for an epic ballad with which they should close their next LP. It was a stroke of genius as it became the perfect ending to an album that had often taken you to very unexpected places with acoustic guitars, lush orchestrations and the frequent use of brushes on the drums, even on the fast and wonderfully explosive Thorn of Crowns, a track which just missed out on being part of today’s feature. And if Ocean Rain was the perfect end to that very album then I’d like to think it is equally the perfect end to the 40th Imaginary Compilation. Thanks for sharing these – great choices. I haven’t listened to the Bunnymen in years – probably time to reacquaint myself! A long overdue one I think. I would have included ‘nothing lasts forever’ because about twenty seconds after I took a phone call telling me my grandad had died it came on the radio. It was a powerful moment. Love a bit of EatB. My first thought on seeing the title was “Zimbo had better be on there”! Going through the extensive Gog EATB collection, I really can’t fault those choices. Great selection, even without Monkeys. I had the pleasure of throwing shapes to The Cutter at an Indie disco in Cardiff on Saturday night. They’re very request friendly and my selections: Joy Division’s Digital and The Cutter were played back to back. I had the dancefloor all to myself. Eight minutes later I was a sweaty mess. OK….confession time. Nothing Lasts Forever was almost included but in the end I wanted Pete on all of the tracks. I’ll do a separate posting on the ‘comeback’ single in due course. Always loved Heaven Up Here, and agree this is exactly the time that E&TB were at their peak. Might have swapped ‘Vilier’s Terrace’, ‘Read it in Book’ or even ‘Do It Clean’ for the less anthemic ‘Zimbo’, but you really can’t go wrong with anything from the first 3 albums. I guess Killing Moon was required by statute or something. You do not tread lightly, my friend. Another impossible task handled with expert care. No additional suggestions from me, I like this one as is. my all-time favourite Bunnymen song is ‘Villiers Terrace’, Also, I’d have to have ‘Altamont’ or ‘Nothing Lasts Forever’ from the Evergreen; I saw them at Barrowlands when they toured that album and they were amazing. For whatever reason I was never that enamoured with ‘Never Stop (Discotheque)’ so I wouldn’t miss that. But losing another track is harder, probably one of the tracks from Heaven Up Here would (reluctantly) have to go, just because it seems over-represented. This is marvellous, an end to end great listen, though I miss ‘Nothing Lasts Forever ‘ and, like Friend of Rachel Worth, have a soft spot for the grey album. Probably a great deal more controversially, I am also a massive, massive fan of ‘What Are You Going to Do with Your Life?’, although I tend to think of it more as a McCulloch solo album. Tough choices but I must add my missing songs too- I’d need My Kingdom and The Back Of Love for sure (possibly at the expense of the Cutter and Zimbo). Angels and Devils is a must for me. I also have a soft spot for the grey album, especially The Game but also Lips Like Sugar. But its very good sounding comp as it is. Great selection from a near-impossible task. I too thought “Is Zimbo there?” I’d probably find room somehow for Broke My Neck, a great B-side. Great compilation JC, but I have to agree with SA – at least with one track – My Kingdom is my favorite Bunnymen track, in fact my favorite song of all time. The other song I would have to have is Pride from Crocodiles. I had the pleasure back in 1989 to spend about 30 minutes drinking with Mac in a club in NYC and we discussed two things – his concern about my brain damage being a Pete Wylie superfan (he might have been joking, might have…) and how My Kingdom should have been a single. I sent my Imaginary Bunnymen compilation, but as soon as I hit send, I was unhappy with my own list. Echo And The Bunnymen could never be anything less than a 30 song, 2 cd compilation for me…but I’m just too close to the music. excellent selection, still as others I would have had a hard time omitting villiers terrace. Glad to see some love for Villier’s Terrace and other early favorites, but can’t quite understand the tolerance for the Grey album or anything that came after. When a band’s been going for close to 10 years and can’t think of any other album title than the band’s name, you know you’re running low on ideas. The near impossibility of the task was one of the reasons I tackled it while flying to Toronto. The notion was that once I had landed, I couldn’t revisit the post and change any of the selections. The memories of tiffanys in 1983 as an impressionable 16yo live long in the memory. For me the band above all bands. For what it’s worth Angels and devils would be in mine. Thanks for this JC. There are some solid bones on “The Gray” album (sorry American spelling). Had the band and label given Gil Norton more space and control to really produce those sessions – and if Pete had rejoined by then, I think it would have been a much stronger album than the Laurie Latham produced product. But it was Latham’s work with The Stranglers that caught Mac’s ear and made him the man for the job. Best example of what might have been is the b-side to Lips Like Sugar – Rollercoaster. It’s a wild ride of psychedelic garage pop. Great compilation, I also would stick to tracks from the first four albums. Having said that I can still relive hearing Dancing Horses, Over Your Shoulder, The Game and Lips Like Sugar and being glad that the Bunnymen were still alive. Heaven Up Here is my fave Bunnymen album (Top 5 all-time albums) but A Promise for me is, and always has been, that album’s weakest track. So Back of Love, Villiers Terrace, Silver, Fuel, Crocodiles in its place. Again like my Stone Roses reply I can’t disagree with your choice’s while thinking some of my @ Sound Track To My Life Tracks@ are missing ………opinions eh ? But Bed Bugs and Ballyhoo is the late great Petes finest moment plus Never Stop the great lost single . And what’s all this all these years about Zimbo ? I really am missing some thing there , I just can’t see it . Opinions ?